Steven (Chicagoland, United States) on 15 July 2010 in Plant & Nature and Portfolio. After crossing the Potomac River on the footbridge to Theodore Roosevelt Island, I discovered that the layout of the island was a series of paths and boardwalks that lead you to the center of the island where there is a "big reveal." This reveal really let us down, considering how influential President Roosevelt was in the creation of the National Park Service. These paths and boardwalks lead through areas that weren't very visually appealing. We came across this tree that had carvings in it. It seemed intriguing, but at the same time disheartening. Photos taken May 6, 2010. Oh dear... if that tree could talk, I'm sure we would be surprised by all the stories he has to tell us ;) Great capture Steven ! What's that guy saying about Lilly ?? Poor tree but composition is very good. I am going to like you to cross very good one on Thursday afternoon. Amicably Antoine. Photomatix has done a great job for you here Steven, great tones and textures. Yes I see what you mean Steven - the tree is intersting becasue of all the inscriotions but the photograph is immaculate - you carry through and convey this great detail beautifully! 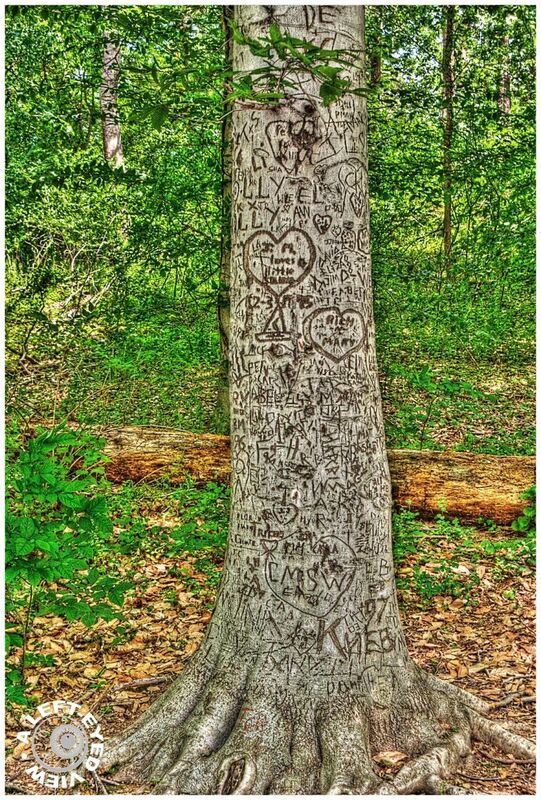 There's a lot of love on that tree. I like how the HDR effect gives the greenery a graffiti look similar to the tree in the foreground. Nice job!